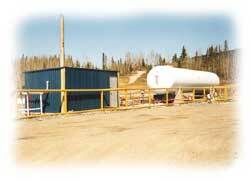 Stittco Energy and its subsidiaries, Stittco Utilities Man Ltd. and Stittco Utilities NWT Ltd., supply propane for domestic purposes. Stittco handles domestic energy and related appliance sales, while the subsidiary operations provide all servicing. A full line of energy-efficient appliances, including furnaces, hot water tanks, clothes dryers and stoves are available at all branch locations. Installation and servicing are provided. Additional products for remote location needs (propane lighting, refrigerators, toilets and generators, for example) can also be obtained. Stittco also carries a line of camping equipment, as well as sauna and pool heaters, outdoor lighting and outdoor cooker/barbecues. Our experienced and fully trained personnel offer complete energy analysis, installation, servicing and maintenance programs to ensure your domestic energy needs are met. The utility operations of Stittco Energy are the responsibility of its subsidiaries, Stittco Utilities Man Ltd. and Stittco Utilities NWT Ltd. Since 1967, the Manitoba subsidiary has supplied the city of Thompson with propane gas via an underground pipeline grid system. This system has proven to be a safe, efficient and dependable means of supplying gaseous energy to communities lacking access to major natural gas transmission pipelines. Stittco Utilities Man Ltd. has two smaller utility systems that serve the commercial areas of Flin Flon and Snow Lake. Stittco Utilities NWT Ltd. was formed after Stittco successfully negotiated an agreement with the town of Hay River, NT to provide a gas distribution system within the town limits. This system is the first of its kind for the Northwest Territories and provides consumers with a gas system normally afforded only to the larger urban areas south of the Territories. Sitttco prides itself in being able to provide the convenience and savings of a gas pipe-line system to remote communities in Northern Canada. Propane vapour utility systems, such as the one in Hay River, are an ideal way to service remote communities and large industrial complexes requiring a versatile, dependable and cost-efficient energy source. Propane is one of the most economical fuels available. The versatility of the fuel and its low impact on the environment make it an acceptable energy source for a multitude of industrial applications, ranging from a small machine shop to a mega project. Propane sourcing from Stittco’s joint venture gas processing plant and other producer arrangements guarantee an uninterrupted supply of propane regardless of the volumes required. Stittco is a total service-oriented operation. We provide it all, from the design, engineering, supply, and installation of the project to the ongoing daily requirements of product expediting, delivery, inventory control, equipment maintenance/service, and safety inspections. Our technical expertise in propane applications covers all industrial needs, from construction heat services to the most complicated process load. Mine air heating, hydro diversion projects, and pulp and paper complexes are just some of the industrial demands we can meet. Stittco personnel can provide expertise and support for any industrial application. Propane is the most versatile fuel for the diversified application that commercial customers require, and Stittco is a reliable supplier. Commercial propane applications vary, from the heating of large shopping centres to the needs of a small restaurant, Schools, hospitals, hotels and banks all require a reliable energy source, and propane is the answer. Our experienced gas fitters understand the needs of our commercial customers and how critical their energy supply is to the success of their operation. For this reason, we offer complete 24 hour service and maintenance to our propane customers. Not only do we realize the importance of servicing what we sell, but we are continually looking for ways to reduce operating costs for our customers, through such methods as the use of high efficiency commercial boilers/furnaces and propane burner conversions. Commercial fleet vehicle owners can also save with propane usage: lower fuel and maintenance costs and longer engine life are the benefits achieved through a conversion to propane.